Home > For Everyday Use > Best Cosmetic Bags & Organizers – Keep All Your Beauty Gear Carefully. Best Makeup Bags & Organizers – Keep All Your Beauty Gear Carefully. What should the best makeup bag look like? There was a time when a cosmetic bag used to look like a large purse. You could put there a lipstick, an eyeliner, and an eye shadow palette with a couple of brushes. A bag like that would have just one compartment, so that all the items were in a pile. To get the lipstick, one had to rummage through all of them. When you do that, the bag might get marks of all the colors of the rainbow, as might your hands. On top of that, spoilt eye shadows will not exactly improve your mood. Nowadays, everything’s different. You can hardly manage without a roomy and trendy cosmetic bag. Besides, it’s perfectly organized, so that you could spend your time more effectively or more pleasantly. How to Choose a Makeup Bag? Let’s figure out what cosmetic bag you need. Of course, it must be durable and easy to clean. But, above all, you have to outline what you want to determine what cosmetic bag meets your requirements best. Amount of Cosmetics: Generous or Modest? The less makeup items you have, the less place for them you need. If your beauty armory includes an emery board, a mascara, and a lip balm, then a small makeup purse is a good choice. However, you may have a makeup item that cannot be crammed into a makeup pouch. For example, a makeup kit with almost two hundreds of eye shadows. is not likely to fit into a pouch. An extensive makeup collection can be placed in a big size cosmetic bag. A dozen of nail polishes, several mascaras, numerous of different brushes can be held in a large makeup organizer. Probably, your makeup essentials are numerous and incredibly diverse. Some of them are used in the morning, others – in the evening, so there is no need to take them with you wherever you go. But they should be well organized, too. For this purpose, there are plenty of middle-sized and big makeup bags. They are very roomy, and you will find each of your makeup accessories there very quickly. Obviously, you should leave most of your skin-care products and makeup accessories at home. And there are some beauty tools which you need throughout a day. You can put them in a lightweight makeup case for handy beauty products. However, if you want to take all the artifacts of your makeup collection with you, you should choose a travel makeup bag or a large toiletry bag, which will fit all your valuables. When beauty becomes a profession, the makeup tools can be calculated in hundreds. We can list brushes alone for hours: foundation brushes, concealer brushes, eyeshadow brushes for every color, powder brushes, mascara fan brushes – the list goes on. Of course, every tool has to have its own place. A makeup train case is good for this purpose. Each type of your beauty gear will be stored in its own compartment, so that you never lose anything. If beauty is not your profession but your lifestyle, you would hardly tolerate an unexciting or uninspiring bag. Do not fret! There are cute makeup pouches, designer cosmetic cases with prints, nice fabric makeup bags, and funny cartoon makeup pencil cases, all of which can match every taste and pocket. 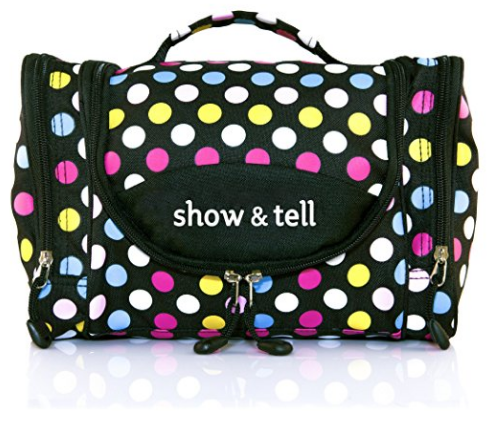 This cosmetic bag is very nice-looking because of its polka dotted design. It is made of waterproof 600D polyurethane. This bag has two inner compartments and two on either side. Each pocket is zippered to store your cosmetics securely. The zippers are rather durable, so you have no need to worry about your beauty tools. The transparent compartment under the top is organized fairly well and is suitable for storing a couple of compact rouges or a not too big eye shadow kit. You can also put a lip balm and makeup brushes there. The main section has enough place for creams, tubes, and perfumes. The bag’s hook allows you to hang it, for example, in the bathroom. The side pockets can accommodate a body spray or hair spray storage. This makeup bag organizer may also function as a hanging cosmetic bag. 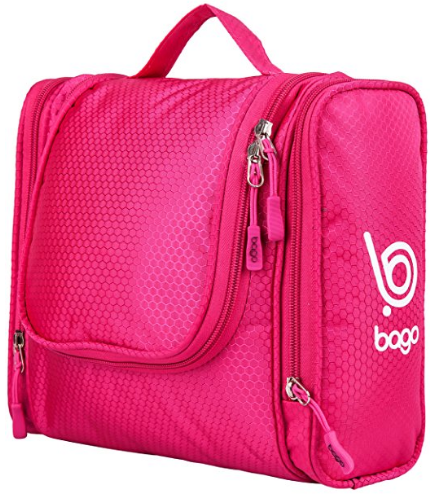 This bag deserves to the name of the best makeup organizer bag for its pretty design, numerous slots and compartments, and multi-purpose usage. This designer makeup bag is made of cotton. So it is not just good looking but can be washed easily, too. The bag is an excellent size for those who carry just some of the most necessary cosmetic products. This small makeup bag is able to hold your minimal beauty gear, which might consist of a nail file, an eyeshadow with a brush, an eyeliner, a mascara, a compact powder, and a travel-sized body cream. 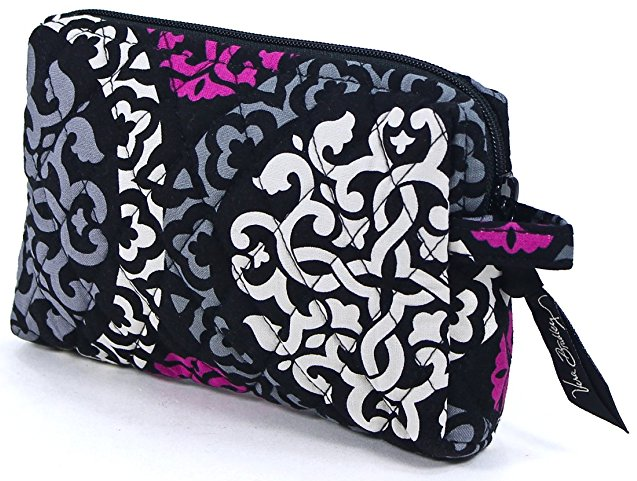 If your cosmetic set is not too large, you can put your mobile phone and accessories (batteries, flashes or a charging cable) into the Vera Bradley makeup bag. Its quality zipper will protect your valuables from falling out. Moreover, the bag is lined with plastic. If any of your beauty products leaks, the bag will contain the liquid and it won’t get into your vanity bag. You will be able to wipe it completely dry later, without any effort. The colors of this small cosmetic bag are very bright, but you can choose your favorite pattern out of a dozen. 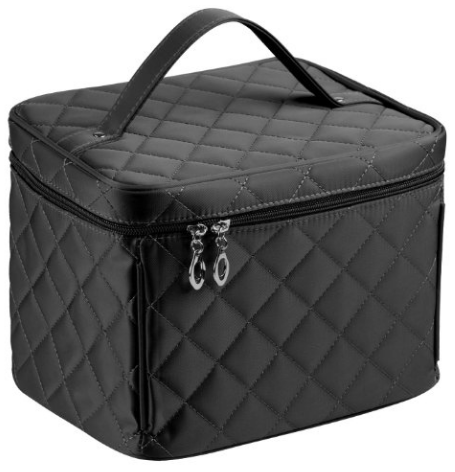 This large makeup bag is made of top-quality nylon. It is easy to carry because of its durable handle. This cosmetic case is also easy to clean. The case comes with a small mirror attached to the top of the bag’s inside. Besides, it’s a good makeup organizer bag as its main compartment is divided into flexible slots for your makeup accessories. The top of the bag also has tight and long pockets, which can be used as a makeup brush organizer. The dimensions of the bag allow you to put there big tubes with moisturizing cream, a sunscreen, and other skin care cosmetics. This bag can be used for more than simply storing makeup. The main pocket is suitable for holding a toothpaste, a toothbrush, and some medicines. One more option: you can place a first aid kit there instead of travel essentials. As you see, the bag is rather capacious, what makes it multi-purpose. One more bonus: a small zipper puller lock will secure your valuables. You can only buy the lock separately. If you like traveling, this bag will be a good choice for you. If you are a home-bird, it will still make a good purchase. The bag can hold all the beauty products you usually take with you on a journey. At the same time, you can place there all your numerous bathroom supplies and hang it in the bathroom. When it hangs on its strong hook, you get an easy access to everything you store in there. Besides, its bright colors will keeps your mood high. The bag has a huge main compartment. Its side pockets are rather roomy, too. You can place your space-occupying skin care products on either side of the travel cosmetic bag. The large but flat accessories could be kept at the top, where a zippered pocket is attached. This compartment is even suitable for a tablet. Also, it’s a good option for a weekend. This bag could accommodate toys, bottles, snacks, and other things that could come in handy for a one-day getaway. The bag is made of a premium nylon, which is very durable. It is rather versatile. It can be used, for example, as a huge cosmetic travel bag. Two of four side pockets make good makeup brush organizers thanks to a dozen of elastic loops. A mascara and a lip gloss or some like tubes can be put there, too. The other two pockets have no dividers, so they can be a good place for a couple of towels. You could even place a shampoo, soap dish, lotion or aftershave in the main large compartment. The elastic straps inside the main compartment will hold your beauty essentials gently but tightly. The top of the bag has an extra inner pocket with a durable hook. It is made for hanging the bag wherever you need. Several inner mesh pockets with zippers can hold a lot of items, so it’s very easy to find all what you need among the variety of your makeup tools and the toiletries. As you can see, the bag could be called the best toiletry bag. It is a perfect organizer for a vacation, business trip, and it can be used at home, too. A travel roll up makeup bag by Mary Kay. It looks like a bathroom bag where you can keep your beauty care products. The roll up bag comes with a swivel hook and can be hung in the bathroom. All your skin care products, which are used in the bathroom mostly, will be within an arm’s reach. The bag is made of a black nylon, which easy to wash. The pockets are see-through, which makes the bag a perfect organizer. Each of your essentials will be visible and it’ll take you a second to get any of them. The travel roll up bag is pink inside, its pouches have a Velcro strip and store cosmetics and toiletry secure. You can also unroll the bag quickly if it is empty or you have no desire to hang it. The plastic containers of the bag are removable. Besides, they are capacious; there is enough place for all your travel accessories. For these reasons, it is the best travel makeup bag for those who prefer long journeys, short trips as well as weekend getaways. This makeup train case is made for professional artists. It has a lot of advantages. The makeup case has a convenient carrying handle and a shoulder strap, so you can carry it over the shoulder. The aluminum frame of the case is durable. There’s no reason to be worried about your valuables: the latches on the top have locks, and the case comes with two keys for them. This perfect organizer has cozy dividers, where you can put many of your professional beauty tools. Moreover, these dividers are removable. A professional makeup artist can keep every item of their makeup collection not to waste time looking for something tiny but vitally important for a perfect makeup. If you drop this train case, its rubber feet will protect it from scratches. Aside from that, the train case can make an excellent gift, and not just for a professional MUA. Sometimes, a middle-sized or even rather large makeup bag cannot accommodate the tremendous number of beauty and skin care must haves. In such a case, choose a makeup train case. This bag is a perfect choice for professional makeup artists, manicurists or those who love to travel. It is very trendy because of its nice colors. Despite its middle size, the makeup train bag is rather roomy. At the same time, it does not look like an unwieldy trunk. The bag is high quality. It has some trays where many beauty tools could be stored. It can also accommodate nail art tools. The trays are made of acryl and could be cleaned easily. The bag is designed with aluminum corners, which makes it sturdy. It should be said that the bag could be a little too small for those professional MUA whose beauty products can be counted in hundreds or are big-sized. If you’re an owner of a boundless beauty collection, you better look for another train case. The lovely mirror is a nice bonus. It sits on the top of the bag’s inside and allows you to access it fast any time. This bag could be used by teens because of its nice look and good holding capacity. 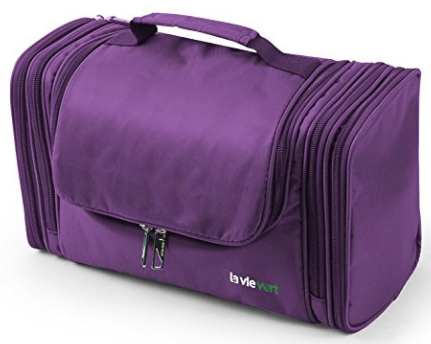 This rolling makeup train case is the most capacious of all cosmetic bags. It is a high-quality product, for the aluminum frames make it strong. The rolling bag has a telescopic handle, so you can either roll the bag or lift it when necessary. The construction of the rolling trolley is rather sturdy. Just one tip: don’t jerk the handle, there is a risk of damaging it. When the train case becomes dirty, it can be cleaned with ease. 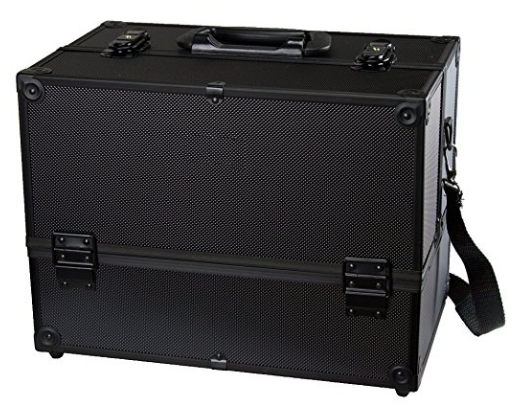 This rolling makeup train case is the best choice for both professional makeup artists and hairstylists. A good option for those who attend a cosmetology school, as well. The multifunction rolling bag is designed for professionals. If you don’t have a large number of beauty tools, there’s no need to choose it. The bottom is very large, there is enough room there for keeping such bag beauty tools as a hair dryer or a straighter. The trays are roomy as well. Any brushes, powders, skincare products, sponges, nail polishes, dozens of lipsticks, varied eye shadows kits and other beauty products could be placed there.